Perky ears are a desired trait that many dog owners want their new canine companion to possess. Standing ears gives off a sense of regalness, providing dogs with a noble appearance. It makes canines look alert and ready to jump into action. There are a number of breeds that are known to have large, pointed ears that rotate to listen to sounds from every direction. Many new dog owners get newborn pups expecting them to have fully formed ears that stand up to attention. However, the reality is much different. All puppies, regardless of breed, are born with soft ears that droop down over the sides of their head. No, that doesn't mean that you were tricked into adopting the wrong breed. Your precious pup's ears simply haven't had the time to develop yet. Your puppy will go through a lot of changes during their first year of life. The shape of their ears is just one of those changes. So, when can you expect your puppy's ears to start standing up? This all depends on your dog's genetics and lifestyle. Not all dogs are meant to have ears that stand up. No matter what you do, you're never going to have a Hound or Cocker Spaniel with tall pointy ears. If you're not sure about whether or not your puppy will have ears that stand up, get some more information about their particular breed. There are many types of dogs that are known for having standing ears. These include German Shepherds, Siberian Huskies, Alaskan Malamutes, Chihuahuas, Corgis, and much more. Dogs that share a similar genetic code to wolves, such as Huskies, will have triangular ears with a defined point. However, breeds like the Chihuahua tend to have standing ears that are rounded. It's important to note that just because the breed is known to have standing ears doesn't mean that your dog will. There are outliers in every group. Outside factors can affect your pup's ear development. There are also many breeds that don't have natural standing ears. For example, many people associate Great Danes and Pit Bulls with having standing ears. However, this is only achieved with surgical modification or taping. If you're still unsure about whether or not your dog will have standing ears, there are other ways to check. One is to see how they're positioned on the head. If they're high on top of the head and relatively close together, there's a good chance that they will stand up when your dog is older. Also, see how they react when your pup is excited. If they perk up a bit, they'll probably stay that way at some point. If you have a puppy that belongs to a breed that's known for having pointy ears, you have the opportunity to watch their ears develop over time. As mentioned earlier, all puppies are born with soft and floppy ears. This is because they lack tough cartilage and strong ear muscles. Typically, it takes several months for a puppy's ears to stand up fully. You may be able to feel their ears firming up after only a couple months of age. Depending on your dog's breed and genetics, it may take as much as six months to get to a point where they're strong enough to stay up 24/7. If they're not standing up after seven months, they probably will never get to that point. Why Has My Puppy's Ears Suddenly Started Drooping? As your dog's ears develop, you'll see them standing up more frequently. Depending on the size of their ears, they may even stand up partially with the tips drooping down slightly. While it may look a bit ridiculous at first, it's a sign that things are developing correctly. But then, out the blue, you may notice that all of that progress has stopped. Your young canine companion's ears may even start to flop around even more! If this happens, don't worry. It's completely normal. You see, at around 16 weeks of age, your puppy will begin the teething phase. Just like human babies, this a time when their strong teeth are growing and pushing through the gums. It's theorized that the ears droop due to the way calcium is being used by the body. Calcium is crucial for teeth and cartilage in the ears. However, when your dog is going through this rapid teething stage, most of the calcium your dog consumes is being used to develop the teeth. Essentially, the teeth are getting top priority. As a result, the cartilage isn't getting the fuel it needs. Will My Puppy's Ears Stay Floppy? Luckily, teething is temporary. You may notice that the ears are quite perky one day, but very floppy the next. Just wait it out and let the teething pass. 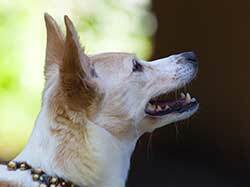 Once your dog's adult teeth are in, that calcium can go back to the cartilage in their ears. You don't have to leave your dog's ears up to genetics alone. There are a few things you can do to ensure that your pup's ears develop right. This can increase the chances of them having majestic ears that stand up all the time. During the teething process, you can give your puppy a boost of calcium. There are many supplements available. Alternatively, you can add a spoonful of yogurt to their food or give them some bones to chew on. However, you need to consult with your vet first. They may advise against it based on your dog's current diet. Too much calcium may lead to bone and joint issues when they're older, so exercise caution. Bones and chew toys are great for strengthening the muscles around the ears. Dogs have a muscle that extends from the jaw to the top of their head. Chewing on some toys can make that muscle stronger, allowing it to support the weight of their ears. The last thing you want to do is damage the cartilage in your puppy's ears. As it's developing, it's very susceptible to damage from rough petting. If it's damaged too much, your dog may end up with lopsided ears. Resist the urge to rub on your dog's head until they're a bit older. Like hard head rubs, rough-housing can lead to cartilage damage. This is very common among puppies who grow up in close quarters. Young pups love to play fight. They'll often pull ears, slap heads, and tackle each other. While socialization is always welcome, keep a close watch at all times. When your puppies are going to sleep, keep them separated so that they don't do damage during the night. Taping is an option if your puppy's ears don't stand up as they should after six months. The method is also used for breeds that don't traditionally have standing ears, such as Great Danes and Doberman Pinschers. It's a controversial technique that's actually banned in many countries around the world, so it's not recommended. With taping, your puppy's ears are wrapped up to essentially reshape the cartilage. There's no need to worry too much about your dog's standing ears. As long as no traumatic injury occurs, your puppy's ears should develop quite nicely. By six months of age, your pup will start to look like the majestic canine you've always wanted to have as part of your family.